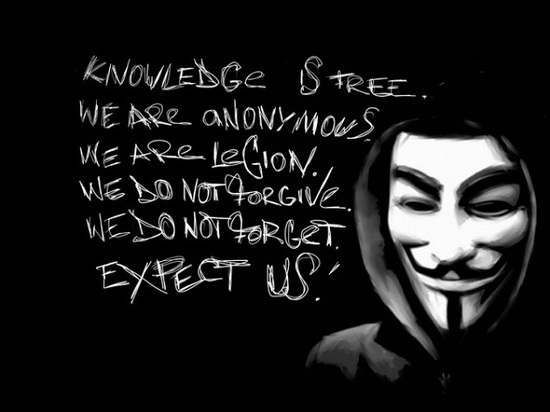 Anonymous Response to Sony : We didn't do it as we will never hurt the innocents ! 1. Anonymous has never been known to have engaged in credit card theft. 2. Many of our corporate and governmental adversaries, on the other hand, have been known to have lied to the public about Anonymous and about their own activities. HBGary, for instance, was caught lying a number of times to the press, to the public, and to Anonymous itself (in this phone call, for instance, ( http://tinyurl.com/...) CEO Aaron Barr makes a number of untrue statements regarding the intent of his "research," claiming for instance that he never tried to sell the information to the FBI when e-mails acquired soon showed that he had been set to do just that; executive Karen Burke was also caught lying to Bloomberg about having not seen an incriminating e-mail that she had in fact replied to just a few days before). The U.S. Chamber of Commerce lied about not having seen the criminal proposal created by them for Team Themis; Palantir lied about not having any idea what their employees were up to; Berico publicly denounced a plan that they had actively engaged in creating; etc. There is no corporation in existence will choose the truth when lies are more convenient. 3. To the contrary, Anonymous is an ironically transparent movement that allows reporters in to our operating channels to observe us at work and which has been extraordinarily candid with the press when commenting on our own activities, which is why reporters prefer to talk to us for truthful accounts of the situation rather than go to our degenerate enemies to be lied to. 4. Whoever broke into Sony's servers to steal the credit card info and left a document blaming Anonymous clearly wanted Anonymous to be blamed for the most significant digital theft in history. No one who is actually associated with our movement would do something that would prompt a massive law enforcement response. On the other hand, a group of standard online thieves would have every reason to frame Anonymous in order to put law enforcement off the track. The framing of others for crimes has been a common practice throughout history. 5. It should be remembered that several federal contractors such as HBGary and Palantir have been caught planning a variety of unethical and potentially criminal conspiracies by which to discredit the enemies of their clients. This is not a theory - this is a fact that has been reported at great length by dozens of journalists with major publications. Insomuch as that our enemies have either engaged in or planned to engage in false flag efforts, it should not be surprising that many of the journalists who have covered us, who know who we are and what motivates us - and who have alternatively seen the monstrous behavior of those large and "respectable" firms that are all too happy to throw aside common decency at the behest of such clients as Bank of America and the U.S. Chamber of Commerce - also have their suspicions that some capable party performed this operation as a means by which to do great damage to Anonymous in the public eye. Those who consider such a prospect to be somehow unlikely are advised to read about what was proposed by Team Themis in their efforts to destroy Wikileaks, and should otherwise take a few minutes to learn about COINTELPRO and other admitted practices by the U.S. intelligence community. The fact is that Anonymous has brought a great deal of discomfort to powerful entities such as Booz Allen Hamilton, Palantir, and much of the federal government; the Justice Department in particular is likely unhappy that our efforts revealed that it was they themselves who recommended the now-discredited "law firm" Hunton & Williams to Bank of America in order that the latter might better be able to fight back against Wikileaks. All of this is now public record, and anyone who finds it laughable that those or other entities may have again engaged in tactics that they are known to have engaged in in the past is not qualified to comment on the situation. Anonymous will continue its work in support of transparency and individual liberty; our adversaries will continue their work in support of secrecy and control. The FBI will continue to investigate us for crimes of civil disobediance while continuing to ignore the crimes planned by major corporations with which they are in league. We do not forget, even if others fail to remember. We not forgive, even if others forgive our enemies for those things for which we are attacked. We are legion, and will remain so no matter how many of our participants are raided by armed agents of a broken system.